In organizations that don’t utilize outsourced recruiting for some or all of their hiring process, the recruiting function is often inconsistent, costly, and unpredictable. Unfortunately, when you start talking about outsourcing, there are a lot of different options, and they’re not all created equal. Let’s take a look at your options. As an outsourced recruiting option, contract recruiters are typically brought on to supplement an organization’s internal team when they have increased hiring demand. In some cases, these “guns for hire” will operate in place of an internal team. With a high hourly bill rate and no accountability for actual results, many organizations have learned that engaging contractors to do their recruiting is expensive and does not deliver results. They are also not really the kind of outsourced recruiting that will help HR leaders create a predictable and consistent hiring function for their companies. Companies hire contingent staffing agencies to find candidates for specific positions. As their earnings are contingent on their customers hiring their candidates, staffing agencies “sell” their candidate’s capabilities and leverage a placement guarantee to help close the deal. Unfortunately, those guarantees offer no real accountability. With an industry average fee of 20% of annual compensation, contingent staffing agencies are incredibly expensive and only manage the sourcing part of the process. They’re really not concerned with hiring manager satisfaction or employment brand because they only find candidates to fill jobs and don’t manage any of the other components involved in the recruiting process. It’s a “fill the job quick so we can get paid” mentality that can inadvertently make an HR leader’s job more difficult when it comes to an organization’s overall hiring process. The last outsourced recruiting option is recruitment process outsourcing. The core mission of an RPO is to partner with organizations to manage their entire recruiting process and improve their overall hiring. 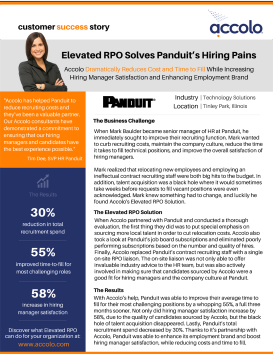 Successful RPO relationships are intended to be long-term, strategic partnerships with built-in accountability to ensure a consistent talent pipeline, lower costs, high levels of hiring manager satisfaction, and improved employer branding. When we start talking about how outsourced recruiting helps you to predict the future, contract recruiters and contingency staffing agencies aren’t really going to help you much. There are just too many shortcomings in the first two options to be able to reliably anticipate your future recruiting processes. Instead, let’s talk about how recruitment process outsourcing can help you predict the future of your recruiting efforts. We all know that recruiting costs can quickly get out of hand, especially if your organization isn’t doing a good job of tracking things like tracking system access, advertising on job boards, background checks, and reference checks. On the other hand, all your hiring costs are rolled into a single cost when you use outsourced recruiting in the form of an RPO. That means you can predict your hiring costs from month to month, and plan ahead for expanding or shrinking recruiting needs based on your organization’s dynamic hiring needs. As an added bonus, you can also predict that your cost-per-hire will actually be reduced when you engage with an RPO to manage your recruiting function. When organizations run all their hiring through an internal recruiting team, the process of sourcing, screening, interviewing, and hiring new employees can be vastly different from recruiter to recruiter. As an HR leader, it can be difficult to create a standardized hiring process, but even more challenging to manage recruiters to stick to it. With outsourced recruiting, a structured and streamlined recruiting process is implemented according to your organization’s needs, and the RPO recruiting team sticks to the plan. Not only will you have a predictable and consistent hiring process, but that consistency will inform hiring manager expectations, drive candidate satisfaction, and energize your employer brand. When organizations use an in-house recruiting team, those team members are not normally 100% dedicated to recruiting. They usually have other duties and responsibilities unrelated to hiring to perform too. Unfortunately, when that’s the case, a lot of those other duties fall through the cracks. With outsourced recruiting, those team members will have the time to focus on other HR initiatives without taking any resources away from the hiring function. In essence, using a RPO allows you to predict the amount of time your team will have to work on non-recruiting activities and allows you to anticipate your ability to tackle new HR projects successfully. As we already discussed, you have a few options when it comes to outsourced recruiting, but if you’re looking for that magical crystal ball you’ll have to stick with an RPO solution. Not only does recruitment process outsourcing take a lot of hassle out of your work life, but it also gives you the ability to predict hiring costs, create a more consistent hiring process, and gives you the opportunity to focus on other HR activities that are equally important to your organization. RPO simply takes the pain out of recruiting. Bring on the crystal ball! Network for Your Net Worth!